About 5 years ago, I broke my ankle. I was coming down the stairs with a laundry bin, I slipped, twisted to transfer the laundry bin to one hand and grab the banister in the other, but I missed. It felt, I later told my friend Hannele, like when someone is electrocuted in a cartoon, and there's a black and white image in which you can see their skeleton and lines emanate from their body. Hannele had come over with sandwiches to sit and visit for a bit, which was just what I needed. Recently (less so than I would like) Hannele also broke her ankle. She was hiking, which is kind of a better story. I do know someone who tripped over the rug on their way to the bathroom in the middle of the night, also breaking an ankle. They tell everyone they were shooting hoops when it happened. But I digress. Another member of the broken ankle club is my friend Eve. We were room mates in college, sharing a small room in an NYU dorm and an even tinier kitchen. We made some meals there and generally talked and baked and cooked a lot for college kids. Over the years, I've really enjoyed hearing about Eve's culinary pursuits. She was an early adopter of the Instant Pot and is always whipping some kind of comforting stew in there. So when I broke my ankle, I remembered that Eve had broken hers a few years after college. We exchanged some messages and she gave me some excellent medical and practical advice. And a little while later, she sent me a care package of Rugelach. It was delicious. I can't bring Hannele a sandwich and some conversation, because she has moved to Texas. It makes perfect sense for me to pay it forward with some Rugelach. I asked Eve for her recipe. Alas, Eve recently moved and couldn't quite put her hands on the cook book in question, so she sent me links to three different recipes. This sounded like a culinary adventure of the stripe we used to take back in college. I had to make them all. "I warn that the dough is kind of a PITA because it's so rich," Eve messaged me. "It's important to chill it thoroughly before you roll it our, or you will have a big fat mess (and you may have a big fat mess anyway)." "In 1793, Austrian bakers, in celebration of the lifting of a lengthy Turkish siege of Vienna, shaped various baked goods into crescents (kipferin) the emblem on the Ottoman flag. 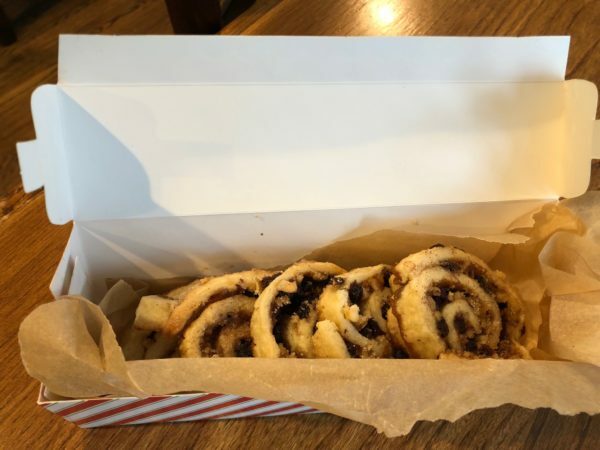 Rugelach ("little twists" in Yiddish) and yeast rugelach - also called Pressburger kipplach and Pozsonyui kifli - are all delicious examples of Austrian cresents. (This is also the origin of the croissant.) American seem to agree, for it has recently become very popular over here . . ."
We are currently about two weeks in to this experiment (I don't have such long chunks of time to devote to this culinary experiment as I did in college. It's done in maybe 1 hour increments between bingewatching The Americans folding laundry and going to Starbucks picking up the kids from school.) Yesterday, my daughter noted that I seemed to be an expert on making Rugelach, as I unrolled my Wilton Fondant fun mat (it has concentric circles all marked with the circumference, in inches.) and pressed a batch of chilled and then warmed up Rugelach dough into a perfectly round shape with my largest biscuit cutter. Then I started rolling and ended up with a kind of amoeba shape. I'm not an expert, but I do have a few takeaways. I made all three versions that Eve sent me. The high brow baker's NY Times take, the reliable back-of-the-package King Arthur Flour take and the bloggy reinvention from Smitten Kitchen. The Smitten Kitchen one calls for making pinwheels rather than rolling them into crescents, so I left that until last. Pinwheels are my baking Waterloo, and I'm already wading outside of my cultural background on these, so I didn't want to seem anymore like a clueless shiksa than I already am. The recipes call for something to be brushed onto the dough. Cider, water, butter and jam are mentioned. I went with strawberry jam for the first few trials, because that's what we have on hand. Later I made a point of getting apricot jam, which I would recommend. Then, the filling. I have always loved Rugelach because of it's sweet, chewy and unique-tasting filling. Turns out it's made with chopped walnuts, brown sugar and currants, which are tiny dried grapes with a slightly tangy taste. There are variations with chocolate and maybe other types of sugar or nuts, but this was my preferred combo, along with a little cinnamon. That is sprinkled on the dough on top of the jam. Some recipes call for pressing the filling down with a sheet of waxed paper, but I found that it sometimes pressed through the thinly rolled dough or made it so thin it inevitably stuck to the surface when trying to roll it up. At this point, you have something that resembles a sweet gooey pizza before you . The next step is to cut it into 16 pieces, and for this I did try a pizza cutter. But if your pizza cutter isn't razor sharp, currant and walnut pieces with throw you off and result in ever more irregular shapes. It doesn't really matter, but if you're OCD about it, I would just use a big, sharp knife for the job. Starting with the fat side of each piece, you roll into the middle. Tucking the skinny "tail" under the cookie, place it on a baking sheet lined with parchment paper. You probably should shape it into a crescent, for historical accuracy, but I never did. I've never seen crescent shaped rugelach, and at this stage there aren't really that workable. So here's where the pinwheel version, kind of rules. You roll the dough into a log and slice the cookies. With the regular crescents, they have to be brushed with egg yolk and sprinkled with sugar, but the pinwheels get tossed with a fork into a cinnamon sugar recipe, which is a good shortcut at a moment when I was often feeling like throwing in the towel. (I did make one a batch without the sugar, and my home audience was audibly disappointed with the result.) In any case, it's about 20 minutes in a 350 oven and then, delicious tender and slightly sweet bundles of dough. Unfortunately for Hannele (and Eve, who I think is owed at least a few cookies for getting me those recipes, for all her ankle advice, and of course for the PITA of making me these cookies back when I broke my ankle) every time I leave a batch to cook before packing the up to send to my sister in broken ankles, they disappear. 1. To make the dough: Beat together the butter, cream cheese, and sugar until light and fluffy. Add the salt. Gradually beat in the flour. 2. Divide into 4 equal portions, form into balls, wrap, and refrigerate overnight. (For quicker use, place in the freezer for about 1 hr. The dough can be frozen for up to 4 months.) Let the dough stand at room temperature until workable. 4. On a lightly floured surface or pieces of waxed paper, roll out each piece of the dough into a 1/8" thick round about 15" in diameter. 5. To make the filling: Combine the nuts, currants or raisins, if desired, sugar, and cinnamon. Brush the dough rounds lightly with the jam, marmalade, butter, or margarine, leaving a 1/2" border around the edges. Sprinkle evenly with the nut mixture. 7. Place the rugelach on ungreased baking sheets. [From Eve: grease the baking sheets, and prepare to scrape off baked-on caramelized jam anyway.] [From me: Use parchment paper] Bake until golden brown, about 20 minutes. Let the cookies stand until firm, about 1 minute, then transfer to a wire rack and let cool completely. Store in an airtight container at room temperature or in the freezer. As Eve wrote "Bon Appetit or as my Grandmother would say, Essen! *"
*essen means eat in Yiddish . And can't you just hear Eve's grandma saying "Eat!" with a plate of rugelach in hand?